The Grandfather Clause: Existing clients get to stay at my current rate, but I’ll quote new clients at a 10-20% higher rate—which avoids the client exodus that you’re concerned about. If you’re in the business long-term, you’ll eventually need to make the business case for raising loyal client prices, too, but a stronger relationship makes that conversation easier when the time comes. The Stealth Raise: Think about it this way: If you’re not a public utility, why would you even announce a price increase or make a big deal about it? Obviously, this one is easiest to implement if you’re calculating estimates rather than working on an hourly or per-word basis—just build in another 10% (or whatever) for yourself. As long as it’s a modest increase, you’re the only one who will ever know. The Circumstantial Increase: You don’t have to permanently restructure your pricing, of course. Instead, put a hefty premium on jobs during busy times or during the holidays. Consider it like giving yourself overtime. Swap Sheet: Personally, I don’t provide a price sheet on any of my web sites, but some freelancers swear by them. So, this would mean simply uploading a new price structure for people to see. You’d want to have a conversation with existing clients in order that it doesn’t come as an unpleasant surprise. Do you have a killer strategy for raising your freelance rates? Please add your comment below! 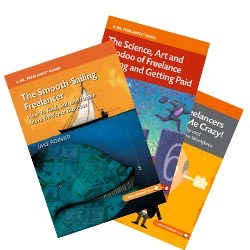 Thanks for sharing this freelance guide. Usually freelancer worries about their rates because some clients are always looking for cheaper price but I guess if you have great skills you will definitely get a better job. I had stopped working for a client a year ago because of scheduling problems, and they told me if I ever wanted to come back, just say so. My schedule freed up recently, and I said I’d come back for a 20% increase. They immediately said yes. Dang! Should have gone for 25%. @Outsourcing, thanks for the kind words. My philosophy generally is to leave the cheaper-price clients to someone else. @Jeanne, your anecdote reminds me of the French phrase esprit d’escalier: meaning literally wit of the staircase, or “When you think of the perfect verbal comeback…after you’ve walked away,” which I learned at this article (along with a couple of other foreign words with cool meanings). Thanks for sharing, and definitely ask for 25% next time! One way I increased my own profitability was by setting better client boundaries as I got more confident. I no longer tolerate mission creep and long pointless phone calls and casual requests for free feedback and ideas. If I do work, I bill for it. Amazing how much that affected my income for the better. Your point on profitability is spot on: clarity and client boundaries are absolutely essential. Thanks for the suggestions. The Circumstantial Increase is particularly on target. @Valerie, excelling points about setting clear boundaries up front. Mitch, thanks for reading and commenting. Your question about hourly vs. project rates is a good one, and an important business factor for freelancers to get right–I’ll respond in one of my posts this week. Thanks, I’ll be looking forward to it. And @Valerie, that should’ve said “excellent” not “excelling”! Fingers sometimes have a mind of their own.